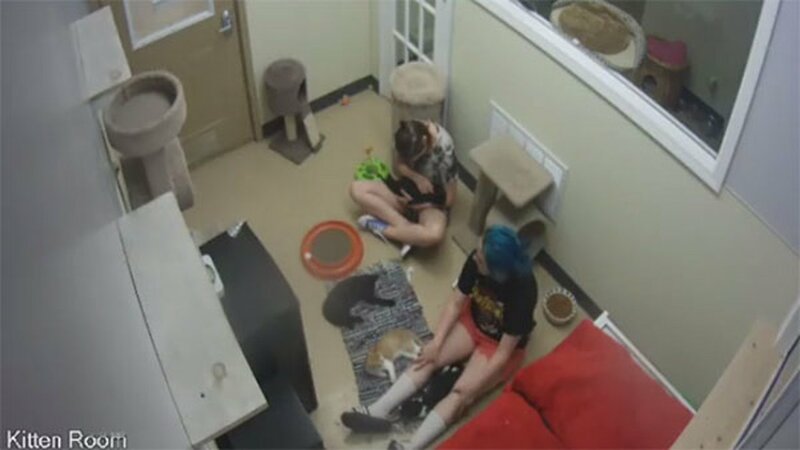 SHOREWOOD, Illinois -- The Will County Humane Society is looking for two teenage girls they said stole a 15-week-old kitten named Fuzz from their facility Thursday afternoon. The group posted video on their Facebook page that shows the girls in the kitten room. "We have footage...showing our proof that they walked in, stuffed Fuzz in their backpack and walked out with our little man," they wrote on the post. The Humane Society said the girls left on bicycles so "we know they live locally." They said Fuzz is a male cat with tuxedo fur, 15 weeks old, not neutered, and with AKC Reunite microchip number 956000005566699. They described him as "very friendly and snuggly!" They are hoping anyone who recognizes the girls will come forward with information and call their facility at 815-741-0695. Anyone with information can also reach out to the Will County Sheriff's Investigation Bureau at 815-727-8574. UPDATE: Fuzz has been returned!